And not as previously advertised ‘Landscape into Art Part I’. After a brief resume of the first presentation, we will together look at the High Renaissance and the transition from Mannerism into the Baroque. 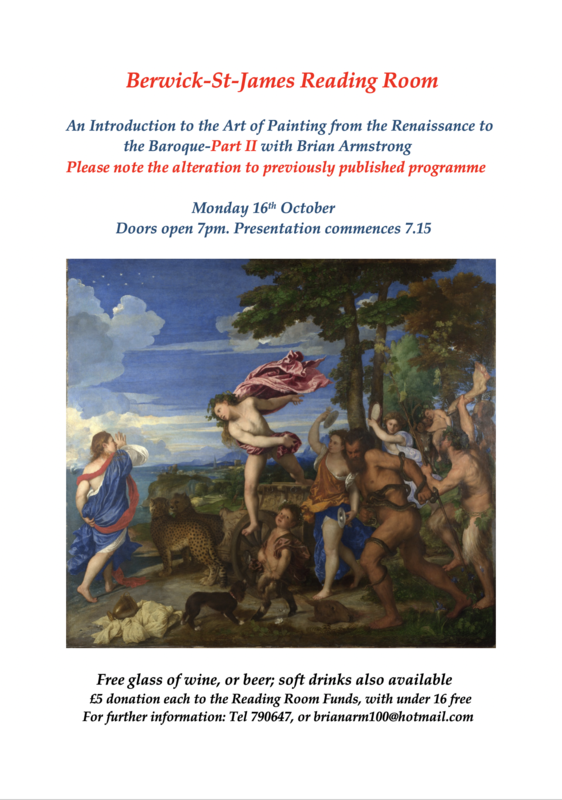 Monday 13th November: Landscape into Art Part I, from Pompeii and the Art of Symbols to Claude Lorrain and Nicolas Poussin. Monday 11th December: Landscape into Art Part II, the Landscape of the Dutch Golden Age to the Romantics and the Art of the Sublime. Further presentations are planned for next year. Doors open at 7pm with each presentation commencing at 7.15. The cost/person, inclusive of wine and other beverages will be £5, payable on the evening, with all proceeds donated to the Reading Room Fund.